Larger, intact regions with minimal habitat fragmentation are considered to have higher ecological integrity. These three factors were summed to create a Conservation Suitability index for every hexagonal planning unit. In the map aboe, areas shown in brown are of low suitability (many small parcels, close to roads, high population density) and the light tan areas are more suitable (larger parcels, further distance to roads, lower population density). The Conservation Suitability index directs Marxan first into areas that have high conservation suitability (low population density, far from roads, low parcelization) and steers the model away from low suitability areas. But, high value conservation targets with high goals may force the model to go into relatively low suitability areas to achieve the 90% goals for targets such as riparian forests and threatened and endangered species. 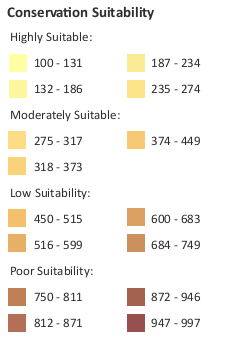 A low Conservation Suitability index number indicates high conservation suitability. The higher the number, the lower the conservation suitability of an area.